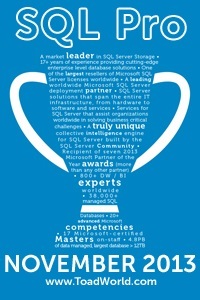 SQLSkills is an amazing resource for the SQL Server community. Between their blogs, white papers, and the SQLSkills Insider emails you should make a point of taking a look. But earlier this year they announced an absolutely astounding new offering. A library of wait types and latches. So now for example when you run Paul Randal’s (b/t) query to determine your wait stats and find out you have a LCK_M_IS_LOW_PRIORITY wait (you probably won’t) you can quickly search on it and find out what it is, when it first became available, and various other bits of useful information, including possible ways to reduce it. So if you haven’t already heard of this library (because I’m sure there are lots of people who read my blog who’ve never heard of SQL Skills right?) you should give it a quick look. Then when you run a query through SQL Sentry Plan Explorer and come up with a wait stat you’ve never heard of you will know right where to go. « When was my index created or at least last updated? What are SQL Skills and why would Kim and Paul want me to have them?